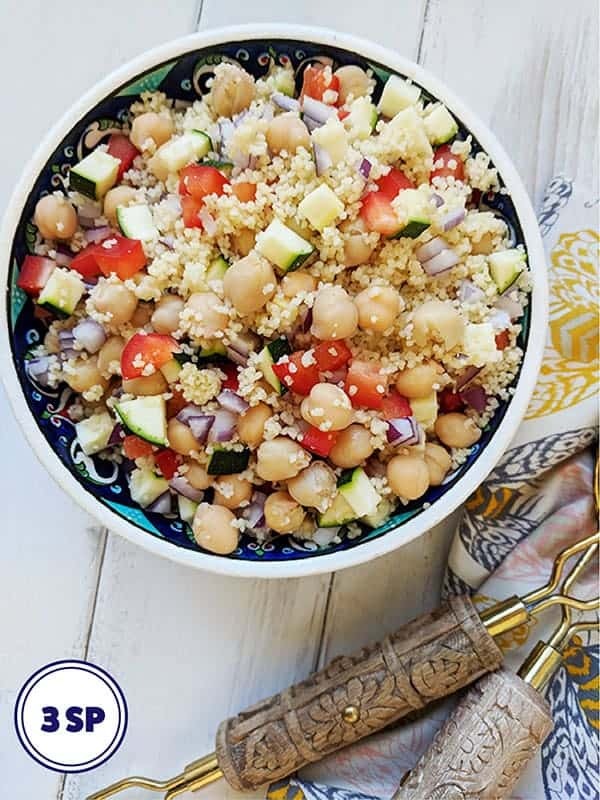 This flavour packed Couscous Salad makes a wonderful accompaniment to chicken & fish dishes. Alternatively it can be eaten as a low SmartPoint main dish. At just 3 SmartPoints per portion this has become one of my go to recipes when I want something, quick, easy and filling to make. 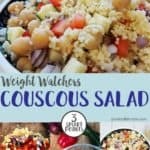 Couscous is such an easy and adaptable food! It can be served as a side dish or like this salad, it can be eaten on its own as a main dish. It’s a staple dish in Morocco, Egypt and Algeria but is becoming more and more popular in the USA and Europe. 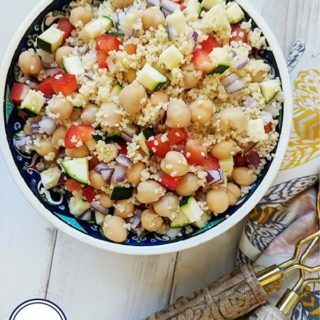 Most couscous found in Western supermarkets has been pre-steamed so it is just a matter of adding boiling water or stock, then leaving it tightly covered for five minutes. 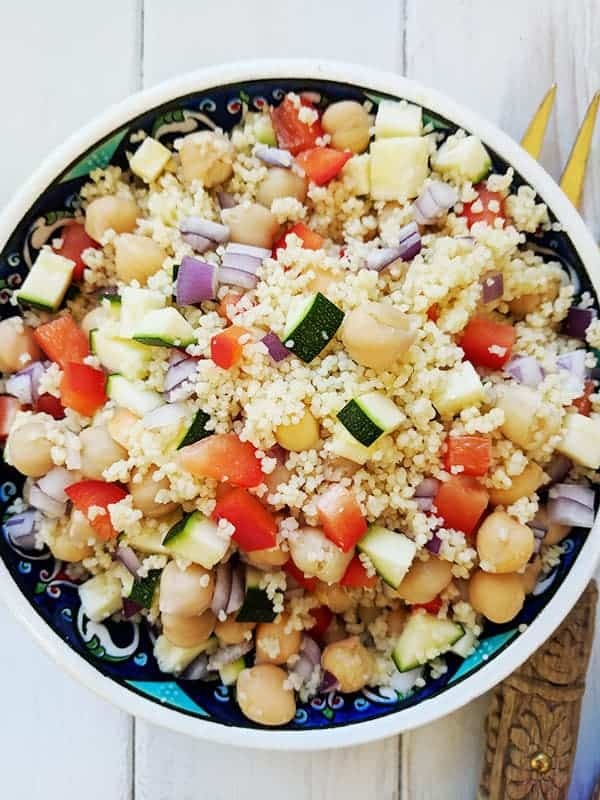 For added flavour for this Couscous Salad, I used a vegetable stock cube to make up the couscous. This gives it just the right amount of seasoning and flavour. Chicken stock would also work well if you were serving it with a chicken dish. 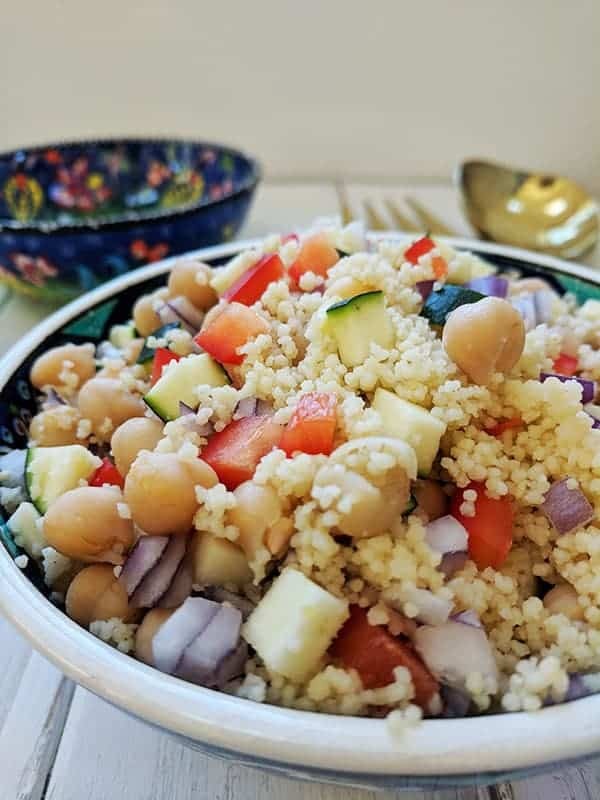 Once the couscous has been ‘cooked’ for 5 minutes and fluffed up with a fork, you add a tin of drained and rinsed chickpeas and chopped red pepper (capsicum), courgette (zucchini) and red onion. And that’s it! How simple is that! If you did and you loved it please give it a star rating below! Place the stock cube in boiling water and mix to dissolve. Place the couscous into a heatproof bowl and pour over the stock. Cover the bowl with cling film and set aside. Chop the, courgette, red onion and red pepper into small pieces. Drain and rinse the chickpeas thoroughly. 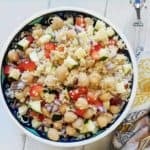 Once the couscous has sat for 5 minutes, use a fork to 'fluff' it up before adding the chopped vegetables and chickpeas. Mix to combine before serving. How much of a serving is there for 3 points?